The airport opened for service in June of 1961. Over the last 50 plus years, we have seen many incredible things... Here’s a bit of history for you. 1925 – Asheville Seeks Airport The Asheville Chamber of Commerce appointed an aviation committee to research the feasibility of developing an airport. Land between Asheville and Hendersonville was identified. 1928 – Airport Development Begins The Asheville Chamber of Commerce and City of Asheville leased land and began developing an airport. 1936 – Regional Governments Make Purchase The Cities of Asheville and Hendersonville and Henderson County together purchased the 122-acres and unpaved runways in exchange for land and cash totaling a value of $31,000. 1944 – Wartime Brings Runway Improvements The U.S. Army Corp of Engineers operated the airport from 1943-1947, providing air transportation for their communications and weather headquarters. During this time, federal funds were acquired to build a total of three 4,000 foot paved runways, a control tower and a fire station. May 14, 1957 – Expansion in the Air The A&H Airport was limited due to the proximity of mountain ranges surrounding the campus, so a new location and airport was planned by leaders in Asheville. In order to grow the airport to accommodate larger planes used in commercial air travel, a bond issue authorizing the City of Asheville to expend up to $1.2 million was passed. January 15, 1961: The new $2.2 million Asheville Regional Airport was approved to operate day and night commercial flights. 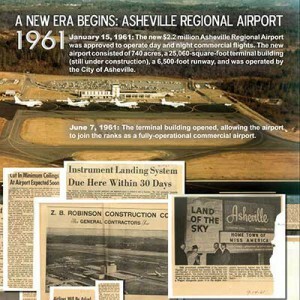 The new airport consisted of 740 acres and a 25,060-square-foot terminal building (still under construction) and a 6,500-foot runway, and was operated by the City of Asheville. June 7, 1961: The terminal building opened, allowing the airport to join the ranks as a fully-operational commercial airport. 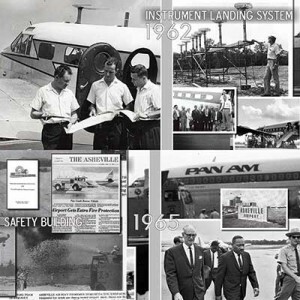 1962: An instrument landing system was installed, providing the added safety measure for pilots of an "invisible highway" to the airport runway. 1978: The runway extension project commenced, thanks to President Jimmy Carter, who delivered $2 million for the project. 1979: The Department of Public Safety building was added to the campus, to house the growing staff of police and fire rescue professionals whose jobs were to provide a safe and orderly environment for the traveling public, visitors and airport employees. 1980: This was a big year of change and growth. Operational management of the airport shifted from the City of Asheville to a newly created Asheville Regional Airport Authority, governed by an independent board made up of appointees by Buncombe County Commission and Asheville City Council. The runway extension project was completed, improving safety and allowing larger aircraft access to AVL on the 8,001-foot runway. Also, baggage claim was tripled in size, and a new gate area doubled capacity for growing passenger numbers. 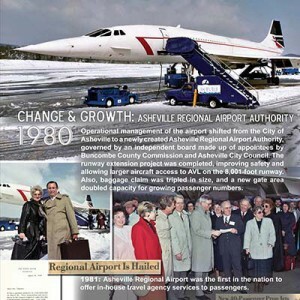 1981: Asheville Regional Airport was the first in the nation to offer in-house travel agency services to passengers. 1986: A state-of-the-art wind shear detection system was installed to improve safety. 1987: Airlines continued to add services, so passengers were flocking to the airport in large numbers. Growth couldn't happen fast enough! A $20 million airport expansion and renovation project began. 1992: The major expansion project was completed, which resulted in expansion of the ticket lobby, baggage claim area and administrative office space. A second-level boarding area and jetways were constructed, as well as an atrium to the existing lobby. The ground-level boarding areas were expanded and renovated. These changes boosted AVL to the fourth largest airport in the state. 1994: An airport welcome center opened. 1998: A loop road was added to the campus to better manage growing passenger traffic. 2003: A new 10,000 square-foot passenger lounge opened - now three times larger than the previous space. Wireless internet access was also added. 2008 - More passengers need more services: This year, new boarding ramps were installed and a rental car facility was constructed to accommodate up to five rental car companies. Worth noting, the Authority Board also appointed its first Henderson County member. 2009 - Momentum of growth continues: stimulus funds received: $17.8 million of improvements were completed, including a Guest Services center, an additional baggage carousel, rental car desks, offices and security enhancements. Also, under the American Recovery and Reinvestment Act of 2009, The FAA awarded AVL with $7.5 million in economic recovery funds to be used for terminal improvements. 2010 - A year of unprecedented passenger numbers: This year, the Airport saw its largest number of passengers in history, due in large part to the growth of air service, amenities and the strong regional support of the area's residents. In addition, the newly expanded gate holding area was opened, now with two-story high ceilings, floor-to-ceiling windows overlooking the runway, new jetways and an expanded security check-point area. 2011 - 50 years, and still growing: AVL has proven that it is an economic engine in Western North Carolina, continually growing and bringing new commercial and general aviation services to the region. Learn more about what we're up to now. In 2014, the Greater Asheville Regional Airport Authority broke ground on Project SOAR - which will result in a complete redevelopment of the airfield. This $64 million, 5-year project is the most significant development project undertaken by the airport since it was originally built and opened in 1961. Learn more here. If you have a piece of airport history, whether it's a photo, artifact, story, memory, or other memorabilia, we would love to hear from you. Contact us at pr@flyavl.com.